This week covers a border six rows wide (unintended pun). 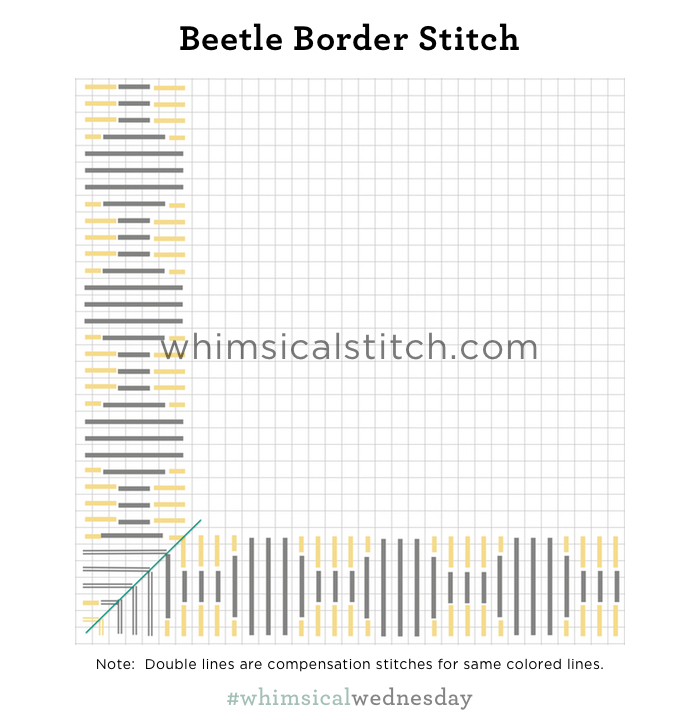 It's the skinny version of the Beetle Stitch. Just as I took a stitch designed for columns (or a border) and exploded it into a background, here I took what I traditionally use as a background stitch and repurposed it as a border. Since this is a straight stitch, the pattern is self contained in each column, meaning you stitch from upper corner to lower corner. You create mitered corners to make a clean transition from vertical to horizontal columns. The bright turquoise line in the diagram illustrates the mitered corner, the diagonal seam that joins the left border with the bottom border. In the example, the border is six rows wide (or tall, depending on direction). This means the full pattern begins on the sixth row. Rows 1-5 (in the corners) are used to create the diagonal seam illustrated above. I recommend that your horizontal columns match, meaning they have the exact same pattern on the same rows. The same goes for your vertical columns. Once you lay in the pattern for the first column of each direction, the pattern is set. For this stitch, there's no rule of what stitch to start with...start with the sequence that makes you comfortable. Just make a note (in the way that works best for you) illustrating what row and what length stitch you started with so you can match it in the other corresponding column. The stitched sample on Instagram illustrates a Beetle border with brightly metallic contrasting threads, specifically Flair and Shimmer Ribbon. If you like what you see on this blog, want to learn some very creative decorative stitches, and how to put them all together, whimsicalstitch.com sells stitch guides for seasonal Melissa Shirley designs. 21 guides are currently available and more are in the pipeline.